A brilliant dual-language board book for babies, toddlers and their parents to enjoy together. 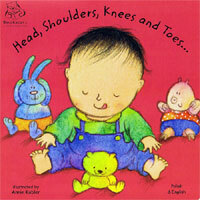 Using a well known rhyme, children are introduced to different parts of the body through illustrations of a baby and his soft toys acting out the song. The soft pencil outlines with rich, warm colours make for appealing pictures to accompany the dual text. This is a title that will be popular both at home and in the early year classes. The dual-language text in this book is simple but is intended for native Polish speakers. Parents would not need to be at an advanced level in Polish to read this book with their child but there is no pronunciation guide provided. I purchsed this book for a multi-lingual event for children. Both parents and children enjoyed this book and learning another language. I would definately recommend. I bought this book for 5 - 6 year-olds with the purpose of learning in another language a song which was already familiar to them. The book is visually appealing and stimulated the children to learn a song in a language not their own.